Bookended by the Pacific Highway on one side and Harbor Drive on the other, what was once a vast parking lot is now a vibrant meeting place called San Diego Waterfront Park. Decades in the planning stages, this huge, 12-acre green space that some call San Diego’s front porch finally opened to a cheerful, much anticipated reception four years ago. The concept behind the building of this park was to create a space where San Diegans and out-of-towners could congregate, share quality time, be active and revel in the uncompromising views of the city’s harbor front. In order to make the locals feel personally invested in the project and encourage visitor-ship, the nearly 50 million dollar price tag was entirely absorbed by the county’s general fund which designates the park as public land. The park is comprised of several distinct areas where different activities can be enjoyed. The centerpiece of the project is the 40 foot wide, 830 foot long and 1 inch deep fountain. Resembling what some describe as the country’s biggest wading pool, on a warm day, this is a hotbed of activity for children of all ages to splash around as the 31 jets gush water up into the air. And, in true California, eco-friendly style, the water is recycled and treated daily. Among the other zones within the park, you’ll find areas custom-built for the younger ones with cool obstacle courses, modern jungle-gyms, a rock wall, steep slides and even skateboards mounted on springs. There are Garden Rooms that feature an array of flowering plants, carved out paths, places to sit and watch the world go by and areas suitable for holding public and private events like weddings, outdoor concerts and holiday celebrations. In fact, much of the park has been designed to accommodate all sorts of events among its many civic greens, plazas and picnic areas. Overlooking this modern facility is the historic San Diego County Administration Center that was officially dedicated by President Franklin D. Roosevelt in 1938. Though certainly one of the most popular spots to visit in and around San Diego’s waterfront, it is one of many options to explore in this picturesque city. Seaport Village, a shopping and dining complex adjacent to San Diego Bay in the city’s downtown district, lures its fair share of visitors with its more than 50 retail shops, numerous eateries and a Sunday concert series where area bands rock out by the seaside. 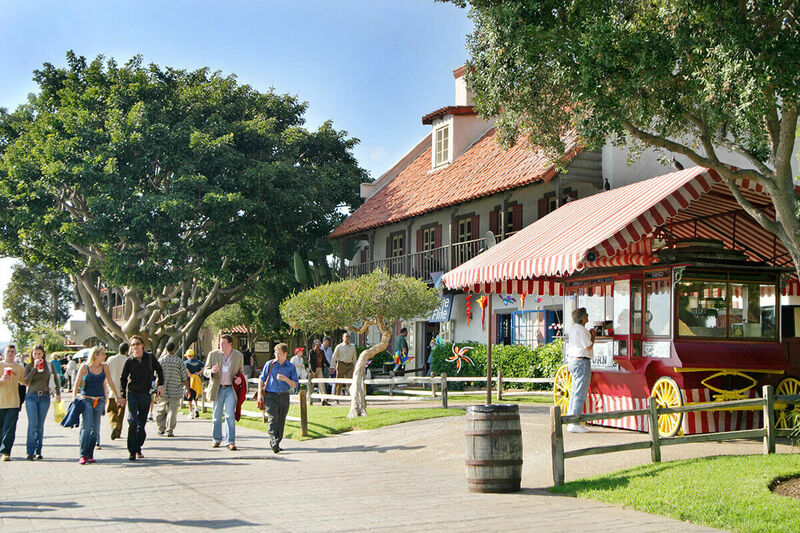 Built in 1895, Seaport Village has a hand-crafted, Belle Epoch-era vintage carousel that boasts 54 animals and two horse-drawn carriages that has been delighting riders for over 100 years. This work of art passed through many hands (six different cities to be exact) before finally settling in San Diego back in 2004. 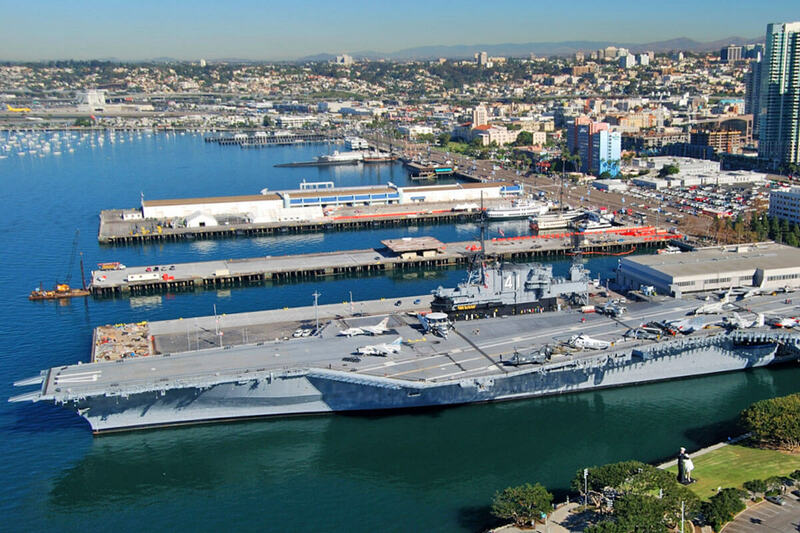 Take a moment and say ‘Hi’ to the ducks at the pond , take a walk along the harbor towards the US Navy retired aircraft carrier, the USS Midway, and take a comprehensive tour of the entire vessel. This floating museum was the longest serving ship of its type in the history of the Navy, lasting from WWII until the end of the Cold War. The Embarcadero, located just next door to Waterfront Park, is a large multi-use space right on the bay that is emblematic of San Diego’s long and rich maritime history. Besides hotels, restaurants and great shopping, this bayside destination features a working fishing harbor, harbor tours, museums and it’s the port where the Star of India is enjoying her golden years. Now, this iron-hulled windjammer ship only sails from time to time unlike when she was at her peak circumnavigating the world 21 times through treacherous, unforgiving seas. 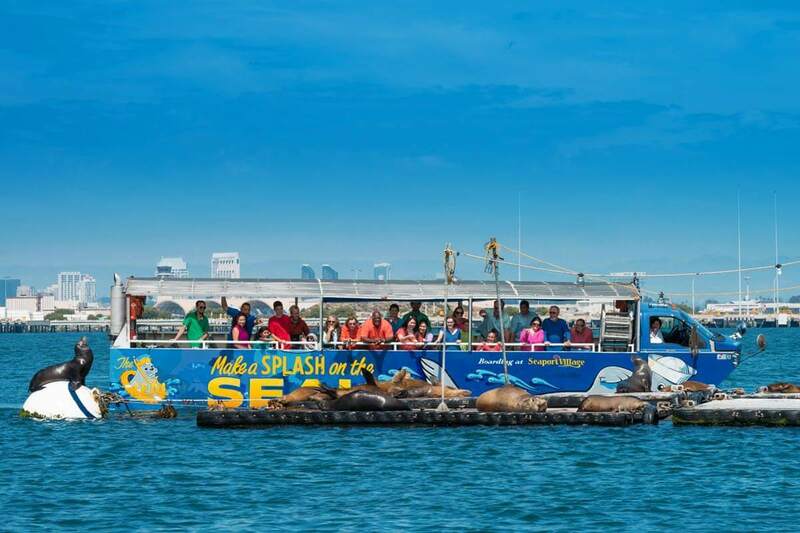 The Embarcadero also serves as one of two departure points for San Diego’s only land and sea tour, San Diego SEAL. Not only do these state-of-the art Hydra Terra vehicles provide excellent, professionally narrated tours of ‘America’s Finest City’ in safety and comfort but they also launch into the San Diego Bay and convert into a boat before your very eyes! A great option for couples is The San Diego City Lights Night Tour. 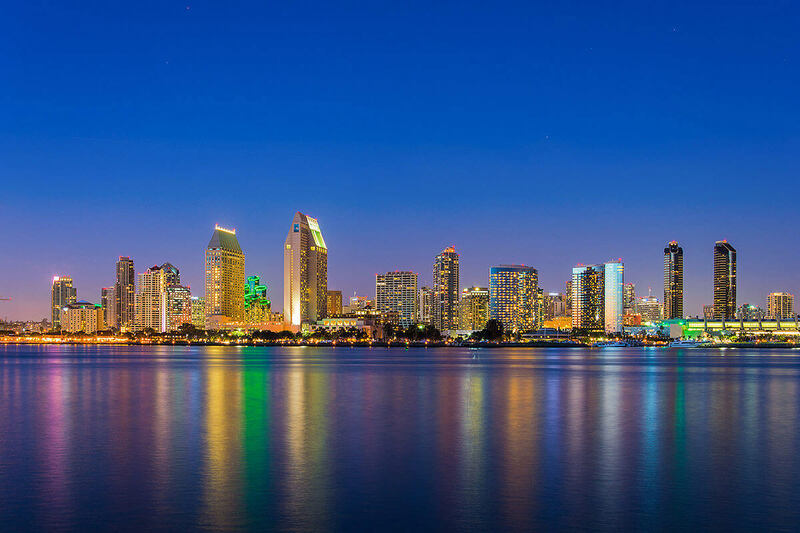 This tour explores a city known for its blue skies and sunshine and introduces you to its shimmering, moonlit side with a chance to see the elegance of Balboa Park and watch the glimmering skyline from Coronado’s Ferry Landing. 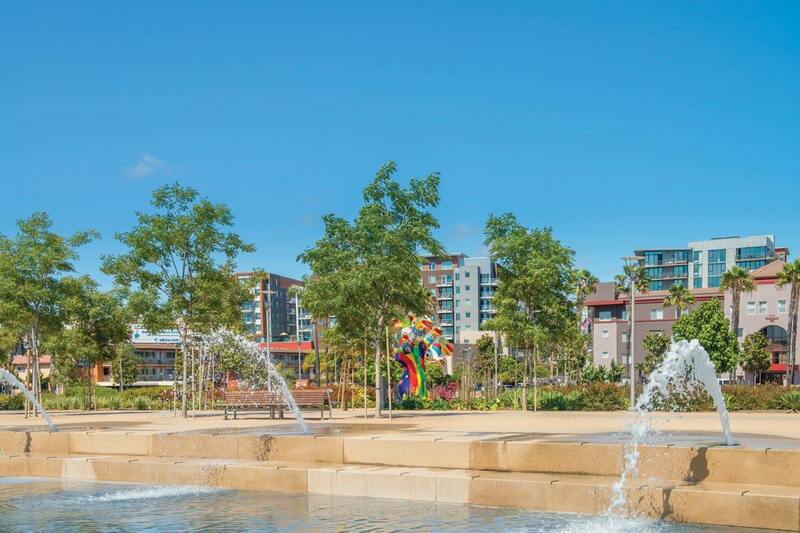 North Harbor Drive’s boardwalk is where you’ll see a year round public art series entitled ‘Urban Trees’ where sculptors and mixed media artists express facets of San Diego by incorporating their artistic vision into the form of a tree. Why limit your views of San Diego to ground level? The Manchester Grand Hyatt’s rooftop bar, The Top of the Hyatt, is where this radiant city really unfurls before you. Enjoy an impressive selection of domestic and imported brews, excellent cocktails and light fare while drinking in the most dramatic views in the city. There is a natural pull towards the water in San Diego as it is home to some of Southern California’s most stunning beaches, the home to the largest naval base in the United States and a great place to catch a wave and some of the best fish tacos around. With these recommendations, you’ll enjoy your time in this classic port town in true SoCal fashion.